Andres Jurado, 29, was collared this week following an incident on a South Beach street. Jurado, an income tax preparer, pleaded not guilty yesterday to a misdemeanor video voyeurism charge. According to police, the pedestrian reported that she was being closely followed by a male stranger who bumped into her when she suddenly stopped and turned around. At that point, the man touched the woman’s buttocks under her dress. The victim, cops say, then noticed that the man--later identified as Jurado--was holding a cellphone under her dress, apparently recording video. 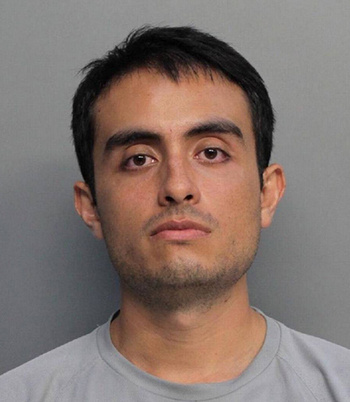 A Miami Beach cop subsequently arrested Jurado and seized his phone as evidence. When he was confronted by the officer, Jurado (seen above) reportedly admitted that such illicit filming was part of a weekend routine. “I do this every Sunday,” Jurado declared, according to a police report. Jurado was collared Monday afternoon, so perhaps his weekly ritual gets extended during holiday weekends.